Growing up, Christine Rees, BA’15 (Media, Information & Technoculture), tried her hand in poetry, short stories, even song lyrics. Then, at 17, while on vacation, having powered through the stack of books she brought with her, and with no Internet connection, she began writing her first book. At 24, she recently published The Hidden Legacy, a young-adult mystery and suspense novel she wrote while completing her studies in Media, Information & Technoculture at Western. “The idea first came to me in high school. I was in a creative-writing class and we were discussing interesting dreams, just throwing around ideas. Some people mentioned premonition. I always thought it was such an interesting idea, but never did anything with it,” said Rees. In The Hidden Legacy, the curse of premonition follows protagonist Faye Lithyer, forcing her to witness death over and over again. During her first and second year in university, she found herself leaning towards paranormal events, mixing them with the mystery and suspense genre. “It’s interesting how the writing process works. You think it’s going one way – and then it veers right. My experiences, talking to people, Sociology classes and I even had a Psychology class, that influenced all that,” she noted. The Hidden Legacy is Rees’ fourth book, but first publication. The earlier works never felt “ready,” she said, adding she is reworking some of her earlier texts. “I pushed for this to be published and that comes when you’re ready to let it go, and you hope it does well. Even now, when I read (The Hidden Legacy), I’m proud of it. You can be like, ‘I should have included this’ or ‘I should have changed that.’ Even now that it’s published, and people have been reading it, reviewing it and enjoying it, it still feels like I can do more – but I’ll come up with a sequel, and possibly another book,” Rees said. Ideas and inspiration come from everywhere – every conversation, song, interaction or ambient sound, even, is raw material. When inspiration comes, she is able to “zone into this other place and see images unfold,” she explained. Sitting down to write, and the actual process of writing is a way to “unlock” the imagination. 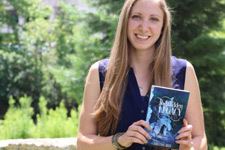 With her first publication out now with Evernight Teen Publishing, Rees is working on another – among a few other projects, including a textbook for Sheridan College, where she studied advertising after wrapping up at Western. Her new book will be a flipped dystopian narrative, she said, which she hopes brings an original twist to a popular genre. “In (popular dystopian books), you’re outside, looking in, trying to figure out what’s happening to the world or what had gone on to make it that way. My book, I decided to flip that, so you know and you’re in the inner circle and you’re essentially one of the bad guys. It’s about the process behind that,” Rees explained. The Hidden Legacy, available as an e-book and paperback through Evernight Teen, is available on Amazon and in the three Chapters, Coles and Indigo locations in London. For more information about Christine Rees and her upcoming works, visit christinerees.com.